Iron (II) sulfide is a chemical compound with the formula FeS. In practice, iron sulfides are often non-stoichiometric. Powdered iron sulfide is pyrophoric. 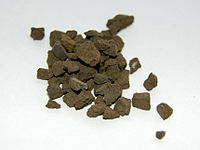 FeS, Ferrous Sulphide or Iron Sulfide can be obtained by reacting iron and sulfur. Certain chemical principles are nicely illustrated using the chemistry of Ferrous Sulphide or Iron Sulfide. The methods of chemical composition can be shown by the production of iron(II) sulfide from iron and sulfur (see equation above). This reaction is exothermic as more energy is given out than taken in. Iron shows ferromagnetism; iron sulfides do not. The presence of Ferrous Sulphide as a visible black precipitate in the growth medium peptone iron agar can be used to distinguish between microorganisms that produce the cysteine metabolizing enzyme cysteine desulfhydrase and those that do not. Peptone iron agar contains the amino acid cysteine and a chemical indicator, ferric citrate. The catalysis of cysteine releases hydrogen sulfide gas that reacts with the ferric citrate to produce or Iron Sulfide. Ferrous Sulphide or Iron Sulfide sticks are widely used as a laboratory chemical for the preparation of Hydrogen Sulphide gas, by famous KIPP'S apparatus when comes in contact with dilute mineral acids. In foundries, during electric melting, residual sulphur level decreases due to cleaner melting practices and the use of low sulphur steel scrap. Ferrous Sulphide or Iron Sulfide is found that iron does not readily respond to inoculants if Sulphur is below 0.04%. Then it is necessary to resulphurize by using Ferrous Sulphide. In Alloy And Stainless Steel Industries To Control Hydrogen Embrittlement It is very convenient and economic to use Ferrous Sulphide or Iron Sulfide for resulphurization in these steels to hold the right level of 'S' and ensuring not to drop 'S' level. Iron Sulfide is used as a resulphurizing agent in the production of carbon, alloy and stainless types of free cutting steels. It acts as an alloying agent to improve machineability of steel castings which are used to manufacture various steel components. The Purification Of Crude Phosphoric Acid Ferrous Sulfide is used in cake form as a reducing agent to remove heavy metal impurities from phosphoric acid. Elemental Sulphur has very low melting point and its tendency to float on the surface of molten metal resulting in the release of Sulphur dioxide, an undesirable gas which pollutes the working environment. Moreover, low melting eutectic brittle compounds form along the grain boundaries and mechanical properties are deteriorated. Hence Ferrous Sulphide or Iron Sulfide and not Sulphur is used for increasing sulphur content of Iron and Steel.